In the movies, humans often fear invaders from Mars. These days, scientists are more concerned about invaders to Mars, in the form of micro-organisms from Earth. Three recent scientific papers examined the risks of interplanetary exchange of organisms using research from the International Space Station. 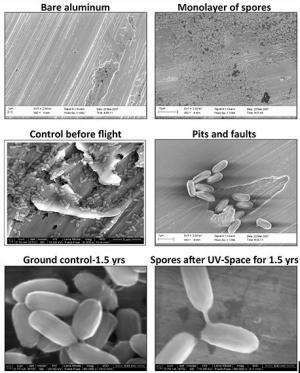 All three, Survival of Rock-Colonizing Organisms After 1.5 Years in Outer Space, Resistance of Bacterial Endospores to Outer Space for Planetary Protection Purposes and Survival of Bacillus pumilus Spores for a Prolonged Period of Time in Real Space Conditions, have appeared in Astrobiology Journal. Organisms hitching a ride on a spacecraft have the potential to contaminate other celestial bodies, making it difficult for scientists to determine whether a life form existed on another planet or was introduced there by explorers. So it's important to know what types of micro-organisms from Earth can survive on a spacecraft or landing vehicle. Currently, spacecraft landing on Mars or other planets where life might exist must meet requirements for a maximum allowable level of microbial life, or bioburden. These acceptable levels were based on studies of how various life forms survive exposure to the rigors associated with space travel. "If you are able to reduce the numbers to acceptable levels, a proxy for cleanliness, the assumption is that the life forms will not survive under harsh space conditions," explains Kasthuri J. Venkateswaran, a researcher with the Biotechnology and Planetary Protection Group at NASA's Jet Propulsion Laboratory and a co-author on all three papers. That assumption may not hold up, though, as recent research has shown that some microbes are hardier than expected, and others may use various protective mechanisms to survive interplanetary flights. Spore-forming bacteria are of particular concern because spores can withstand certain sterilization procedures and may best be able to survive the harsh environments of outer space or planetary surfaces. Spores of Bacillus pumilus SAFR-032 have shown especially high resistance to techniques used to clean spacecraft, such as ultraviolet (UV) radiation and peroxide treatment. When researchers exposed this hardy organism to a simulated Mars environment that kills standard spores in 30 seconds, it survived 30 minutes. For one of the recent experiments, Bacillus pumilus SAFR-032 spores were exposed for 18 months on the European Technology Exposure Facility (EuTEF), a test facility mounted outside the space station. "After testing exposure to the simulated Mars environment, we wanted to see what would happen in real space, and EuTEF gave us the chance," says Venkateswaran. "To our surprise, some of the spores survived for 18 months." These surviving spores had higher concentrations of proteins associated with UV radiation resistance and, in fact, showed elevated UV resistance when revived and re-exposed on Earth. The findings also provide insight into how robust microbial communities are able to survive in extremely hostile regions on Earth and how these microbes are affected by radiation. 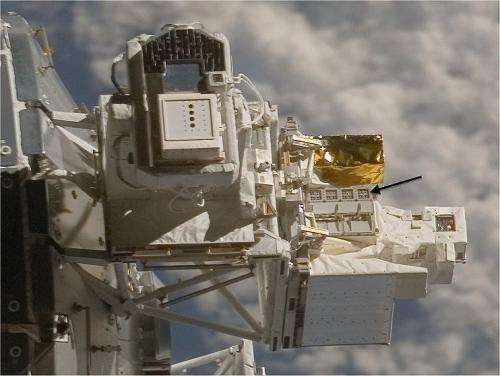 In another investigation, spores of Bacillus pumilus SAFR-032 and another spore-forming bacteria, Bacillus subtilis 168, were dried on pieces of spacecraft-quality aluminum and subjected for 1.5 years to the vacuum of space, cosmic and extraterrestrial solar radiation and temperature fluctuations on EuTEF. These samples also were subjected to a simulated Martian atmosphere using EuTEF. Most of the organisms exposed to solar UV radiation in space and in the Mars spectrum were killed, but when UV rays were filtered out and samples were kept in the dark, about 50 percent or more of those subjected to other space- and Mars-like conditions survived. That makes it likely that spores could survive a trip on a spacecraft to Mars if they are sheltered against solar radiation, perhaps in a tiny pocket of the spacecraft surface or underneath a layer of other spores. The third study placed rock-colonizing cellular organisms in the EuTEF facility for 1.5 years, further testing a theory of how organisms might move from one planet to another, known as lithopanspermia. In this scenario, rocks ejected from a planet by impact with, say, a meteor, carried organisms on their surface through space and then landed on another planet, bringing that life with them. For this investigation, researchers selected organisms especially adapted to cope with the environmental extremes of their natural habitats on Earth, and found that some are also able to survive in the even more hostile environment of outer space. Lithopanspermia would require thousands or even millions of years, much longer than the experiment's duration, but results provide the first evidence of the hardiness of these organisms in space and suggest the possibility that space-traveling rocks could carry life between planets. Future exploration missions can use the results of these investigations to help find ways to minimize the risk of contaminating another planet. The findings also will help prevent scientists from incorrectly identifying an organism that hitchhiked on the exploring spacecraft as a native of the planet, when in fact it's an invader. That's a good thing, because no one wants to be responsible for an alien invasion of Mars. Wasn't Fred Hoyle crucified for his promotion of the panspermia hypothesis to the extent that the Swedish academy shamefully deemed him unworthy of their award even though he fully deserved it? Partly, yes. Also because he believed that the Big Bang was impossible; flu was caused by sunspots; Archaeopteryx was a hoax; and that AIDS came from outer space. Hoyle's work on nucleosynthesis was indeed Nobel-worthy. But the committee was afraid that giving him the prize would make people think the crazy hypotheses he spouted were scientific consensus. The space station is below the Van Allen belts. How much more harsh would the environment be for these critters if the facility were above? What is the difference of microorganisms "invading" a planet using spacecrafts as a means of transport or metheorites? What if terrestrial microbes have been doing just that for millions of years hitching a ride on stones every time a meteor impacted or planet sending parts of it to space? Personnally I don't care. We haven't found any native life in Mars yet. Finding that Earth organisms can adapt and live in Mars is a more important breakthrough to me. if they can survive then they are already on mars before anything manmade ever reached there. earth rocks have been raining down on mars for billions of years. undoubtedly much of that has hardy microbes in and on them when they left earth and then arrived on mars. Isn't escape velocity on earth something like 10 km/s ? This combined with an impact strong enough to send that rock into space. How would any living organism survive that? Am I missing something? Because clearly that can not be possible. Ii may well be possible. I am not a biologist but I've read that some capable scientists do believe that organisms can survive ejection and a millions years transit to an off Earth destination. "What if terrestrial microbes have been doing just that for millions of years hitching a ride on stones every time a meteor impacted or planet sending parts of it to space?" It would be an incredible(though imo not surprising)discovery and would be amazing to study the ecosystems they've created and if/how they have reacted to new life if/when it shows up on a meteor. "What is the difference of microorganisms "invading" a planet using spacecrafts as a means of transport or metheorites? " human activity. if we alter things and interfere it makes it a lot harder to study it's "natural" evolution and how things were before we got there. It's like introducing an invasive species right before you want to study the natural ecosystem of an area. apparently there are extremophiles in orbit already. so, if there was a high-impact collision with the earth and material left orbit for mar, it could pick up space spores after it had cooled down a bit on the way out. We haven't found any native life in Mars yet. Well, we haven't really looked, yet. Especially not subsurface or in the polar ice. it's a bit early to declare it open season for dumping our lifeforms on Mars. We may be throwing away the chance of a (or several) lifetime(s). So let's not be too hasty about this. Descending in a meteorite is a bit different than descending in a spacecraft. A spacecraft offers a protective interior. On a meteorite life would have to be encased inside some cavity. A spacecraft also is a refuge for slow adaptation (a 'mother organism' inside the craft can continue to produce offspring until one happens to hav a mutation that lets it survive outside). A meteorite is a one-off chance. Survive the way it is when it impacts or die. Yes, that is common discussion. Has anyone considered that "Earth" life may be Martian in origin? That's another reason why we shouldn't contaminate Mars just yet. If we find something - and it looks realted to Earth life - we could never be sure where it came from.